Tutorial coming soon! This one is in the shop. Wow – just seeing this! I have some "Wheels" – I love the dots you put with it! Allison, this is really cute. I love striped bindings! I am looking so forward to your tutorial. Love it! Can't wait for tutorial! What a fantastic grouping of fabric! This is so cute! LOve the binding on this quilt! Absolutely adorable!!! 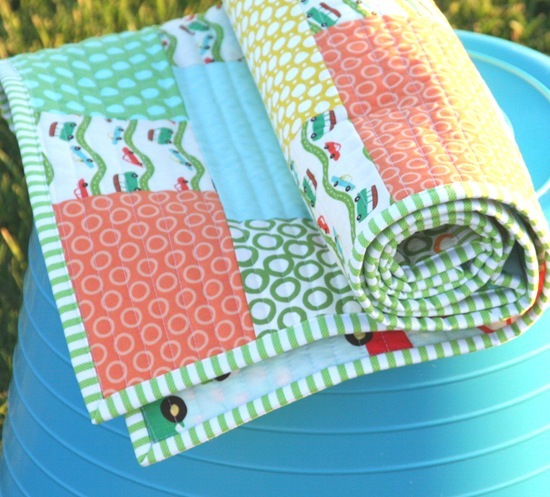 I just bought a ton of the wheels fabric too, too cute to resist! Can't wait for the tutorial, love all your tutorials! So cute! I love the straight line quilting. I love this quilt. The fabric is too cute! That is so cute. I have a bunch of fabric from that line and used this print to make a bib for my grandson's 2nd birthday. Adorable quilt. The binding stripe is perfect. Do you remember where you got that? Uh, this just made my "to-sew-list"! That is a darling quilt! I love that fabric so so much! Oh good grief, just when I think you can't possibly improve on cute! Your quilt is gorgeous. I love the vehicle fabric! I love how you just use one print out of the 'wheels' fabric line….mine are done too…I need to stop writing about how much i really like yours so I can take pics of mine…. Seriously, I LOVE YOUR QUILT….it's feels so light and summery!…GREAT JOB! Gorgeous! Can't wait for the tutorial. Beautiful! 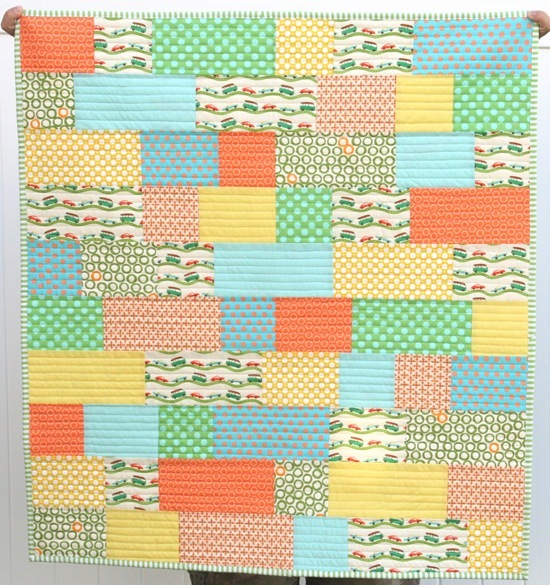 I love how you've incorporated the bright Wheels fabric into a more subtle quilt. Looks lovely. What a great quilt! Love the simple quilting. Beautiful. It's a perfect combination of colours and shape, very nice! It's so colourful and pretty. i love it! What an adorable quilt. I really need to buy some of that fabric soon. I understand many places are running out of that already. I have a site where I buy my embroidery designs from that has digitized the vehicles and stuff from that line of fabric. Matching those designs with your quilt would be super cute. I, too, LOOOOVE straight-line quilting but it sure as heck is boooring. :) Adorable project! Love that fabric…great quilting. A great way to showcase that favorite fabric! I love it! My boys would have gone nuts over that fabric when they were younger! The straight-line quilting is great with the wavy roads. I seem to be the only person who loves to do straight-line quilting. It is so magnificently mindless! Yup, got some wheels, will be doing the tutorial as soon as you're ready. Do you ever use the spray on adhesive for this type of quilting instead of basting with pins? I love it! I can't wait for the tutorial. What a great quilt and what a happy quilt. It will be easy to make and no matching points nearly .I think the fabrics makes this quilt. Love it. I adore this quilt! I'd love to make something similar for my son — he's all about cars and trucks and anything that goes!